Sir Ian Blair flies out to New York to lecture on the threat of 'home-grown mass-assassins'. Delicious opportunity for satire ensues. Meanwhile, his Met minions have 'mapped' the networks of criminal gangs operating in London. Sadly, it won't be available as a Google Earth plug-in. Perhaps they used it this weekend, when 200 officers raided The Fridge in Brixton, on a drugs bust. Eleven people were arrested. Bromley continues to collapse in on itself. 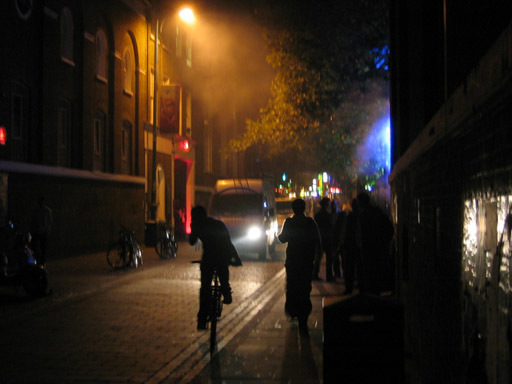 Photo of Brick Lane at night by M@.